Employment | BSHM Architects, Inc.
BSHM Architects is a place where talented practitioners seeking to expand careers can reach their potential. Whether you are just emerging from your academic studies or are an experienced designer, we offer the chance to work on a wide variety of projects in a collaborative studio environment and the opportunity to interact with talented senior staff. Each day brings new challenges and opportunities to learn. All four partners and senior associates are dedicated to the advancement and training of young architects. Our interns are encouraged to ask questions and voice their opinions. While here, they may be required to build models or render design presentations, however they are also given the opportunity to contribute to projects in meaningful ways that help them understand the process and prepare them for better professional careers. Interns often have an opportunity to become full time staff after finishing their degrees. BSHM allows professional registration candidates development time to prepare for and to take their examination. Junior staff who are tracking their IDP credits are assigned senior staff to help with the process. The firm encourages active participation in the AIA. Each year national, state and local component, AIA dues are paid by the firm for eligible individuals. Opportunities for further education in the form of continuing education credits are frequently organized and provided by the firm. 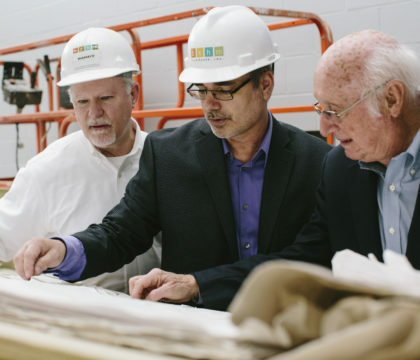 BSHM is a member of the USGBC and encourages all its professionals to become LEED accredited, because responsible architecture and stewardship are at the core of our practice. BSHM reimburses the cost of attending a LEED workshop and the LEED exam once it has been passed. Our employees are dedicated, hard-working individuals who strive to provide our clients with the best professional service and to keep our projects relevant in terms of design and sustainability. The atmosphere at BSHM is a friendly but professional one. Many lifelong relationships have been forged over a cup of coffee (or tea) and the cultural process we incorporate to develop design solutions. We want to work with talented fellow practitioners who truly enjoy what they do. Collaborative studio environment with excellent growth opportunity. Compensation: We offer a competitive salary and benefit package commensurate with qualifications and experience.